Business runs on email and email often runs on Outlook. Using secure IMAP, Rackspace Email is fully compatible with Outlook (and any other desktop email client); both on Windows and Macs. It also plugs seamlessly into email applications on tablets and smartphones. Business never stops and email has to be accessible from anywhere, at anytime. 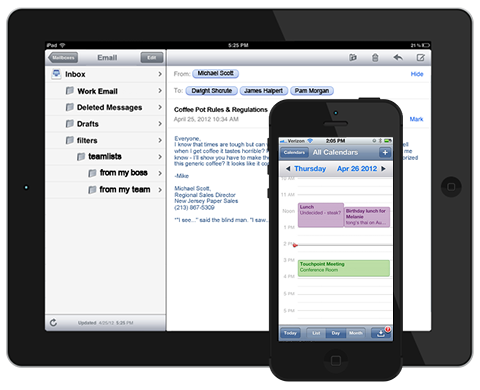 With Rackspace Email, you can enjoy IMAP access on practically any mobile phone or tablet. With Rackspace Email Plus, you’ll also get Mobile Sync to keep your email, calendars, and contacts always synchronized with Rackspace Webmail on your iOS, Android, or Windows device. Rackspace Webmail is powerful enough to be your everyday — every email — messaging application. In addition to robust email capabilities, it also features collaboration apps and tools to help your business collaborate and communicate more effectively. When you store your files in Rackspace Cloud Drive, you can access them anywhere using any device. Desktop Sync on Windows and Mac assures that you’re working on the most up-to-date version of your files. And with a copy in the cloud, you’re protected against issues like ransomware, theft, or dead hard drives.